Clear skies. Gusty winds during the evening. Low 41F. Winds SW at 20 to 30 mph..
Clear skies. Gusty winds during the evening. Low 41F. Winds SW at 20 to 30 mph. Scooting down the trail with the Magic Valley ATV Riders . 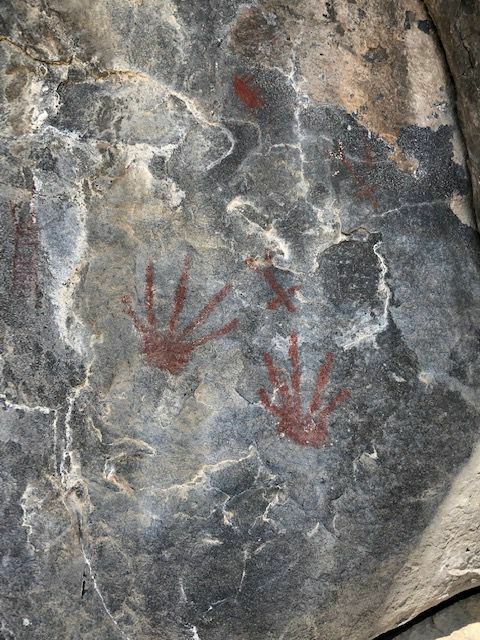 Handprint petroglyphs believed to be left by the Shoshone Tribe mark rocks in Devils Corral. Stopping for a photo on the trail. A view of Shoshone Falls was a welcome sight at the end of an all-day ride. When I met retired police officer Kent Oliver at an unmarked intersection on a dirt road off Shoshone Falls Road, I had no idea my motorsports adventure would be much more than just a wild ride. Oliver, president of the group, prepped me with a gear check, a solid pair of wind pants and a proper helmet. He checked my understanding of the brake system and gear shifting, and he warned me to look down before I stepped into the desert sand and lava rock, since rattlesnakes populate the arid landscape. With a pack of eight all-terrain vehicles in tow, leaders clipped on earphones to confer with the pack via radio. Riders stowed a decent stash of wind clothes and emergency tow gear into their machine’s carry cases and backpacks, and the Magic Valley ATV Riders set off into the bright sun of Snake River Canyons Park. Aboard a Can-am Outlander Max, I throttled the machine along dusty inclines and wells of endless trails and embankments. The other seven riders straddled fancier trail models including Razors, a Can-am Maverick and an Arctic Cat Wildcat. 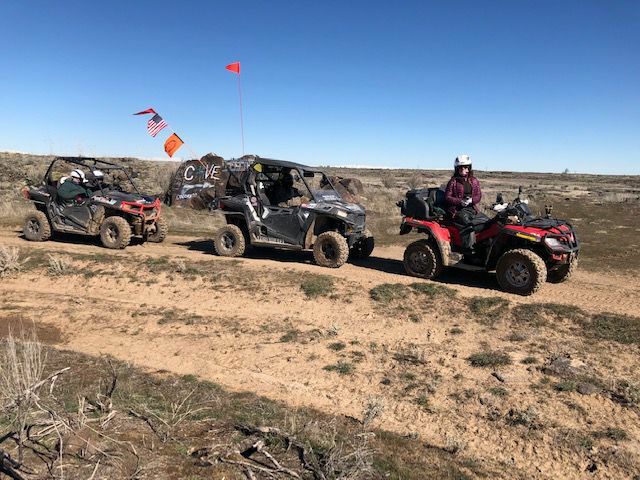 Their orange reflective flags flapped high in the wind, above the billowing dust clouds that fanned out like tails behind each four-wheeler. When I lost the two riders behind me, I quickly learned the golden rule of the trail — wait on the other side of a turn until the pack unites before moving on. But a bit of backtracking resolved this early mistake and the group was back on track. Our first detour was Clay Cave on the north side of Bureau of Land Management land, where we went spelunking about a half-mile inside, blanketed in damp darkness. Luckily, Oliver had packed some hefty flashlights, which we used to study the cave walls, frosted with a layer of silvery dew clinging to the rock like shimmering cobwebs. The cave continued onward for miles, but I only went as far as I felt I could still navigate my way back alone. It was hard to forget the rattlesnake warnings I’d received at the outset of our tour. Winding along the north rim, mountain ranges surrounded us on several sides. Adventure is their route to increase awareness. They explained their trail building efforts and land cleanup efforts as we admired Vineyard Lake from atop a canyon wall, a glittering body of green juxtaposed against the mighty Snake River. The aerial view was stunning. Our next side tour was to Devils Corral, a recess in the landscape and home to historic petroglyphs believed to be left by the Shoshone tribe. Three of us meandered along the mile-long winding path in the warm spring sun, stepping through dense sagebrush to reach a handful of unique petroglyphs comprised of handprints, Xs and arrows marked with a red dye on the rock. Hawks swooped overhead while Oliver spoke of buffalo and native Americans who once inhabited the open land, along with outlaws who likely took shelter in the protective lava rocks, which hold the heat and provide perfect enclosure. As a newbie in the area, I had only seen Shoshone Falls from the observation deck and the Canyon Rim Trail. Riding up to the edge of the canyon and seeing the falls from the other side to my left and Pillar Falls to the right — along with Evil Knievel’s jump site across the gap — lent a brand new appreciation for the magical landscape. While Oliver climbed out onto the precarious bench seat overlooking the deep abyss, I hung back, away from the edge, admiring the depth of the canyon in the glimmering light. The sound of water echoed up through the canyon walls, hundreds of years of history reverberating through its walls, through the earth, and vibrating through my own bones. We rode back to the trailhead in silence along a section of an old wagon trail, once used as a travel route between Shoshone Falls and Jerome. When I caught a glimpse of the interstate, I wondered if any passerby knew the incredible landscape just next to the freeway. At trail’s end, I returned Oliver’s gear and thanked him for the ride. He offered a knowing grin as if he could tell I would be back. We had covered 40 miles riding, and had gone hiking, spelunking and waterfall viewing along the way. Covered in dust and mud, I headed back to town, a mere 15 minutes from where I had gone underground, over land, and back in time.